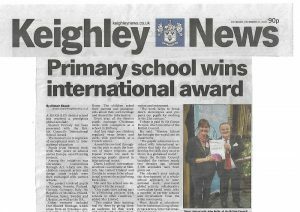 We are very proud of the international work which the pupils do at Steeton School. We often take part in eTwinning projects which link with our Creative Curriculum work and our French learning. Many of these projects use ‘eTwinning’ – a Europe wide network of teachers and schools, funded by the European Union. We believe that, for pupils at Steeton Primary, working with their peers in other countries has become a regular part of their curriculum. We are delighted to announce that we have achieved the eTwinning School label. Only 29 schools in the UK have received this accolade! 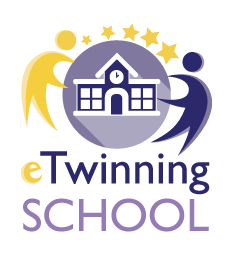 The label is awarded to schools who have run high quality European eTwinning projects across the school, with a good approach to eSafety and who have promoted eTwinning to other schools. 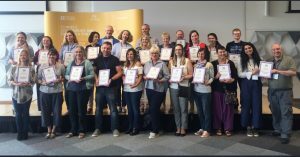 The first eTwinning School labels were awarded at the 2017 UK national eTwinning conference in June 2018. Mrs Linford, our International School Co-ordinator, collected our plaque! Our recent international eTwinning projects are listed separately – we hope you enjoy reading about our work in our eTwinning projects pages! Our French teacher, Mrs Linford, is a British Council eTwinning Ambassador for our region and trains teachers in other schools about how to use eTwinning to increase the international dimension in their schools. We won a Highly Commended award in June 2018 for our Christmas Connections through Art 2017 project! Mrs Linford collected the prize at the eTwinning conference in June 2018. 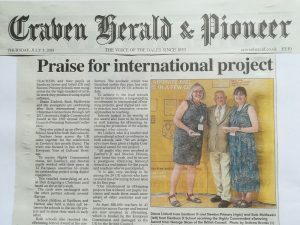 This was published in the Craven Herald on 5 July 2018. We hold the full International School Award, which lasts for 3 years. This year, 2018, we have successfully applied for re-accreditation of this award. For this award, we had to show that we learn about international issues across the school, have lots of international links and that we work regularly with schools in other countries. 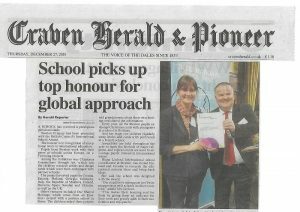 Mrs Linford went to London to collect the award in December, at a ceremony in the Houses of Parliament. We hold the highest level of the Fairtrade Schools Awards: we are a FairAchiever School. This shows that we learn about Fairtrade, we have a Fairtrade Group and we hold events such as Fairtrade Stalls. We have a long-term link with a school in Brittany – the École St Vincent in Brest. All children from Years 1 to 6 exchange Christmas cards with the children in France every year. This year, our Key Stage 1 pupils all have a penfriend in the French school and are writing to them every term. In June 2016, Mrs Salminen and Mrs Kokko visited our school. In October 2017, Mrs Linford visited their school in Oulu, Finland. In October 2018, she visited our partner school in Velika Ludina, Croatia. We have been finding out about schools in Finland and Croatia from her.